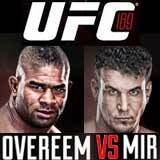 Review: 2014-02-01, pretty good fight between Alistair Overeem and Frank Mir: it gets three stars. The former K-1, Strikeforce and Dream champion Alistair Overeem entered this fight with a pro mma record of 36-13-0 (95% finishing rate) and he is ranked as the No.9 heavyweight in the world, he comes off two consecutive defeats suffered in 2013, the first one against Antonio ‘Bigfoot’ Silva (=Overeem vs Silva) and the second one to Travis Browne (=Overeem vs Browne). His opponent, the former Ufc heavyweight champion Frank Mir, has an official record of 16-8-0 (75% finishing rate) and he entered as the No.11 in the same weight class, he is a black belt in kenpo karate and bjj but he comes off three consecutive defeats, the last one against Josh Barnett (=Mir vs Barnett); currently the #1 in this division is Cain Velasquez. ‘The Reem’ Overeem vs Mir is on the undercard of Renan Barao vs Urijah Faber 2 – UFC 169. Watch the video and rate this fight!